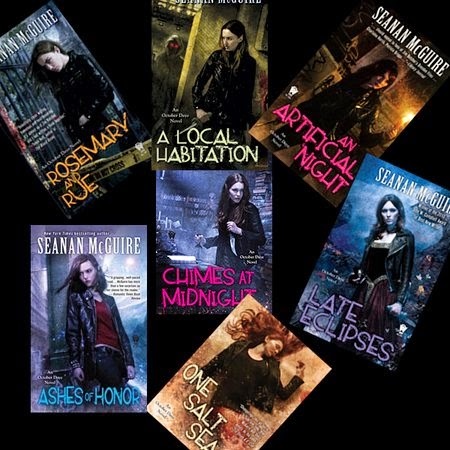 Mira Grant (that is, Seanan McGuire) just announced the arrival of a new short story in her Newsflesh universe, so – in what is becoming something of a tradition for me – I thought about retracing my reading experience with her previous novels. Zombies were not exactly my kind of narrative trope: not on the screen and certainly not in book form. So I’m still unsure about what made me pick up the first book of Mira Grant’s Newsflesh Trilogy: probably some glowing review that underlined how different it was from the usual fare – no matter the reason, after the first few pages I was hooked, and at the same time discovered a new author, one that’s quickly entered my “buy whatever comes out” list. 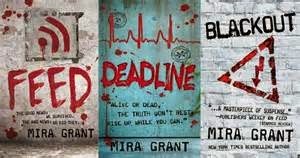 Mira Grant is the pen name of Urban Fantasy author Seanan McGuire – I plan on recapping soon her still ongoing, successful series about private investigator October Daye, but for now I’ll concentrate on the alter ego who created this stunning, ground-breaking trilogy: Feed, Deadline and Blackout. The premise: twenty-odd years from now the world will be dramatically changed by a zombie epidemic whose origins come from the accidental interaction of two experimental viral cures for cancer and the common cold. Exposure to this mutated virus (Kellis-Amberlee, from the names of the two scientists working on the projects) does indeed cure the targeted ailments but also resuscitates the dead – in the Newsflesh world it’s called “amplification”. There are two short stories that expand on this premise, and I recommend them both to better understand the train of events: one is Countdown (the tale of the incident that started it all) and the other is San Diego 2014: the last stand of the California Browncoats (the start of the epidemic seen through the eyes of the famous convention’s participants). The ground-breaking choices I mentioned come from the fact that the usual bloody scenarios of a zombie apocalypse are strictly kept as background information: yes, the un-dead move around searching for victims – not so much to consume their flesh but rather to spread the contagion, in a sort of viral prime directive – and there are whole sections of the world made uninhabitable by the concentration of zombies, but what Mira Grant focuses on is not the cheap thrill of blood-and-gore images but rather the way people and society have changed because of the epidemic. Amplification has forced people to completely review their way of living: houses have become fortresses capable of withstanding massive attacks from the un-dead; pets above a certain body weight – say a small dog – are out of the question, because above that limit they are subject to amplification just as humans are, and the phenomenon extends, of course, to other common animals as cows or horses, whose mass makes them as deadly as infected people. And then there is the terrible choice that everyone must be prepared to face: when one of your loved ones, or friends, dies and then amplifies before your eyes, you have to decide between survival and the impulses of your heart. How would that change the unwritten laws of society? How would it affect ethics and morality? Fear is therefore the main driving force of society: fear of the infected, of course, but also fear of excessive proximity or crowded areas – someone dying of a heart attack in a crowd could amplify and start a new outbreak; fear of contagion, that requires constant blood checks before entering any enclosed space, be it a coffee shop or one’s own home; fear of whatever and whoever can’t be controlled. An enlightening quote summarizes the situation all too well: “...we have embraced the cult of fear, and now we don’t seem to know how to put it back where it belongs.” Fear can also be a powerful means of control, because a scared and divided humanity is much more easily subdued – or lied to. The antithesis of fear is truth, and its… paladins, for want of a better word, are bloggers: the first to recognize the threat of the virus and to spread the word when the government still hid behind carefully worded statements. Bloggers are, at the start of the story, a force to be reckoned with, and the new heroes of a world that keeps turning in upon itself with every passing day. Enter Georgia and Shaun Mason, highly successful bloggers who have been selected, together with their team, to follow the presidential campaign of candidate Ryman: this represents an enormous opportunity for visibility, but it will also lead them along very unexpected and terrifying paths. This is all I dare reveal about the story, because its hair-raising twists and turns must be discovered on their own: suffice it to say there is not one moment when the tension lets go, and where drama is delivered without pulling any punches – no matter how painful they can be to the readers. What really matters, and what I can safely share here, is that it’s a fascinating look at a profoundly changed society, and also a character-driven narrative that will keep you on your toes from start to finish. Not the easiest of books, granted, nor something I would recommend before bedtime either – but still I urge you to read them, because Mira Grant’s storytelling and powerful characters are worth the extra effort needed to find the necessary strength to do it. What makes these books stand out is the human dimension of backgrounds and characters: the words space opera often make us think about vast empires, galaxy-spanning wars and wondrous technology, but this is not the case here. The theatre where the action unfolds is our own Solar System in an advanced stage of colonization, where the older and more established outposts – like the Moon or Mars – enjoy a comfortable way of life, while the newer ones, like the civilization growing in the Asteroid Belt, still deal with problems like microgravity and its deep effects on human physiology, or the rising prices of air and water in a hostile environment. Political and economical tensions are always one step away from flaring into all-out conflict, and there are forces working – more or less covertly – to tip the balance one way or the other. Add to that a few realistic details like communications lag across vast distances or the problems of space travel, which requires a constant battle against the pain of acceleration – endured through the use of drugs – and you have a very relatable universe, as are the characters that people it. Summing up the story is far from easy, especially when trying to avoid any spoilers, so I’m not even going to try. The first book, Leviathan Wakes, follows mainly two characters: Miller – a middle-aged police officer who has lost all his drive and motivations, and wakes up only when what looks like an open-and-shut case he’s been assigned turns into something else, something both suspicious and frightening; and Holden, ex military now working on an ice cargo hauler: he’s the kind of person who wants to do the right thing, to be a good guy, and more often than not makes huge mistakes, with unpredictable consequences. The novel alternates chapters between these points of view until the two men meet and face an unforeseen danger that adds some touches of horror to the story. 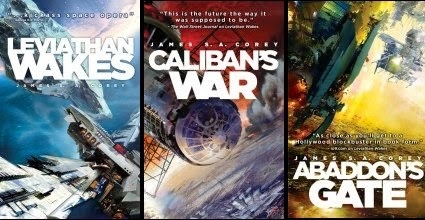 The other two books, Caliban’s War and Abaddon’s Gate, expand on this core theme, widening the picture to include complex political scheming tied with economic interests, and convoluted games of power that still dare to go on despite an all-encompassing menace. Holden, and his crew of almost-rogues, embody that concept very well: enmeshed against their will in something too big for them to handle, they try to do their best with the limited options at their disposal. In the first book there’s a marked antithesis between Holden and Miller, between idealism and the need to set things right on one side, and tired cynicism on the other, the bitter acceptance of the impossibility of seeing the “good guys” win. Despite their differences – or maybe because of them – these two men form a strange alliance that will be the one of the driving forces of the story. This focus on humanity goes on in the following books, exploring more deeply the characters of Holden’s crew – a closely-knit group for whom I felt an immediate attachment – and several other players, big and small, who feel as fleshed-out and solid as the main protagonists. A special mention goes to the female characters, that the authors created without using a single strand of cliché in their DNA: Naomi, of the Rocinante’s crew, smart, though and outstandingly excellent in her job, gifted with a wry sense of humor; Martian marine Bobbie, steadfast and powerful, a fighter in more ways than one, but still possessed of a softer side; shrewd politician Avarasala, who knows how to wield her power, and can cuss like a hardened sailor; minister Anna, gifted with a steel resolve under the caring attitude. They are far from perfect, but I liked them exactly for this reason – because they feel real. Given that each of the separate books of the trilogy managed to raise already hight stakes, it’s hardly surprising I was waiting with feverish anticipation to read the next installment (the first in a new trilogy, according to what I’ve read online): even though the main narrative threads have been brought to an end, many more have appeared and they would seem to point to a further widening of the picture, both in scope and in setting. Cybola Burn, the fourth volume, came out on June 5th and so far it looks very promising so… stay tuned for the forthcoming review!